Kodak EasyShare SV811 Firmware installation instructions.Determine If Your Frame Needs This Firmware Upgrade. Locate the serial number sticker on the back of your frame. If Model Code VX appears on the sticker, your frame has the latest firmware and does not need this upgrade. 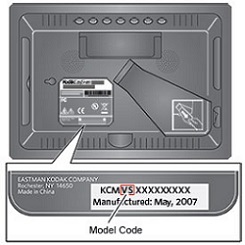 If any other code appears, review the installation instructions, then click Download to upgrade the firmware on your Kodak EasyShare SV811 frame. Turn on your frame.If a USB cable is connected to your frame, disconnect it. On your remote control, press Home.Press the 4-way button to select Settings, then press OK. The Setup screen appears.Select About, then press OK. The Setup – About screen appears and displays your current firmware version. Press OK then press Home. Download the .img file to your computer. Copy the .img file to the root directory (not in a folder or subfolder) of a memory card or USB flash drive, then insert the memory card or USB flash drive into your frame. On your remote control, press Home. Press the 4-way button to select Settings, then press OK. Select Upgrade firmware, then press OK. The current firmware version on your frame and the version on the memory card or flash drive appears. Select Upgrade firmware, then press OK to begin the upgrade.CAUTION: Do not turn off your frame or remove the memory card or USB flash drive during the upgrade. The upgrade is complete when the progress bar completely fills. A check mark may appear on some frame models. Remove the memory card or USB flash drive from your Kodak EasyShare SV811 Digital Frame. Wait 5 seconds, then turn on your frame. If prompts appear, such as language selection, follow the prompts until the Home screen appears. Verify that the firmware is upgraded. See the above instructions, Determine Your Current Fimware Version. Also, you click here for Kodak EasyShare SV811 Downloads.